Chef Jay Scallon Photos by Chris Trela. 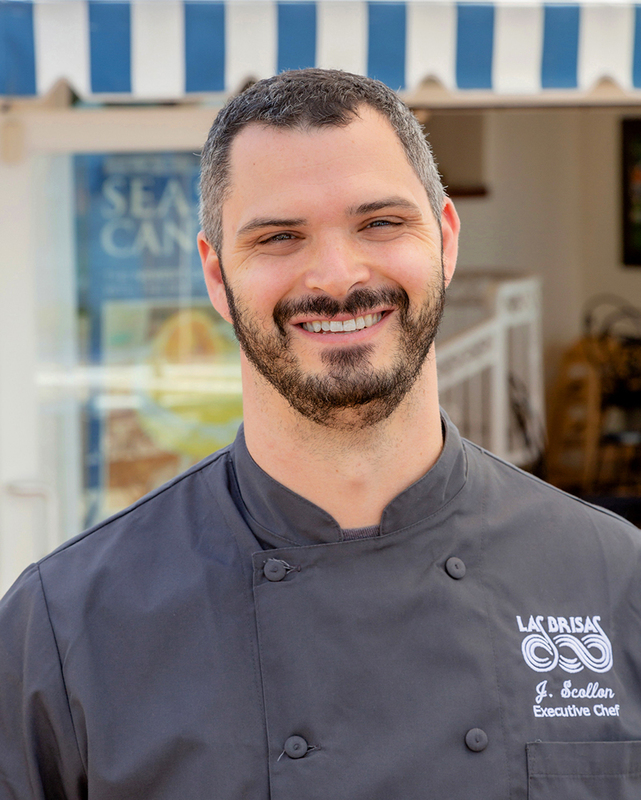 That was my hope when I was invited to Las Brisas recently to sample the restaurant’s new patio menu courtesy of new executive chef Jay Scollon, a graduate of the Le Cordon Bleu School of Culinary Arts in Pasadena. Scollon comes to Las Brisas after a stint as executive chef for a small restaurant group in Culver City specializing in a gastro pub fare. Prior to that, he worked in several upscale kitchens including Hatfield’s, a Michelin star-rated restaurant in Beverly Hills. He replaces chef Matthew Robinson, who helmed the Las Brisas kitchen for less than a year before departing several months ago. Robinson created a burger that wowed me: a patty made up of sirloin, short rib and brisket, cooked to order and piled atop a brioche bun with bacon onion jam, Havarti cheese, foie gras aioli, and a fried egg, accompanied by perfect house-made chips. Yes, foie gras aioli. That burger is gone. 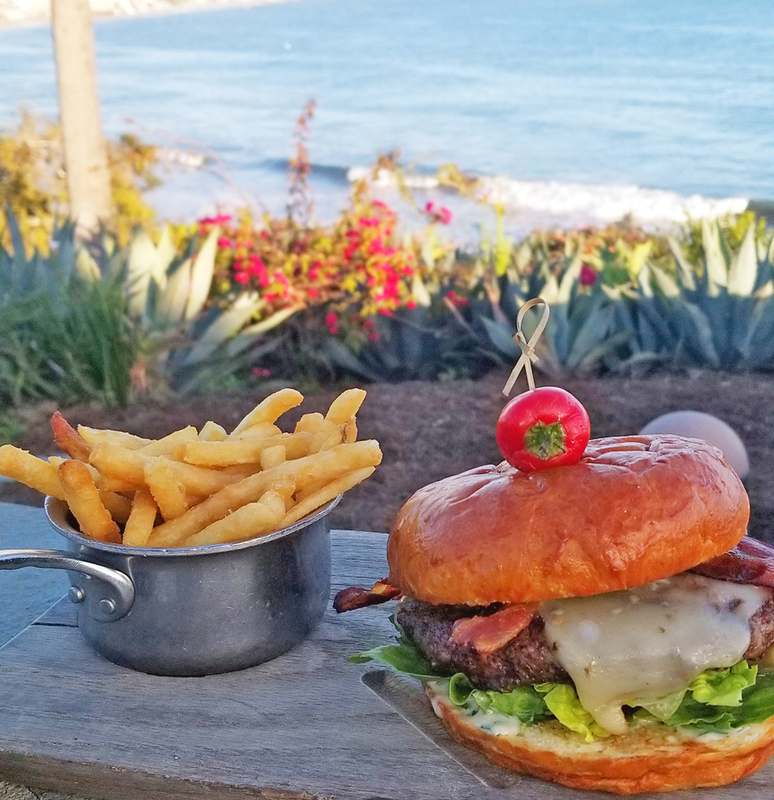 The new Brisas burger has bacon, roasted green chilis, charred scallion aioli, pepper jack cheese, lettuce, tomato, packed inside a brioche bun with a side of battered fries. The burger is very good, but less adventurous than its predecessor and possibly more in line with the Las Brisas clientele. And that’s the challenge for Chef Scollon, the third chef to oversee the cuisine at Las Brisas in 12 months. Las Brisas is renowned for its coastal views and fun vibe. So how do you elevate the menu without alienating diners looking for good food that won’t surprise their palates? Scollon has made a good start with the menu served on the patio and in the cantina. Three fellow foodies and I enjoyed classic margaritas and sampled several items from that menu: chips and guacamole (apparently a Las Brisas staple. Sous chef Kelvin Crisostofo said they go through 20 cases of avocados daily), charred asparagus (a nice switch from charred brussels sprouts), a trio of pulled chicken tacos, and the burger, among others. The newly constituted burger on the Las Brisas patio menu. We settled on the shredded chicken, but were disappointed to not have the option of trying three different tacos. For those who have not been to Las Brisas lately, the restaurant went through a makeover including a renovated bar and refreshed interior. The restaurant is open for breakfast at 8 a.m. Monday thru Saturday; happy hour runs 3 to 8 p.m.